1) What ending do I need? Check the “Applications” section in the technical manual to see if you find any similarities to the solution you are looking for or read about the different endings in the “Standard cable endings” section on the next page. If you want a regular ceiling attachment, a stopper is the most common choice. The other end is left free (F) for assembling of gripper. Zinc plated cable is a little harder and can therefore carry a slightly heavier load. S/S cable is commonly used in damp enviroments. Standard cable construction used is 7×7. 3) Which cable diameter do I need? Check the table in Weight guidelines. Look at “Recommended load” and choose the one closest to the weight of your product. 4) What length do I need? We supply cable in a wide variety of lengths; 500 mm, 1000 mm, 1500 mm, 2000 mm, but also custom specified. 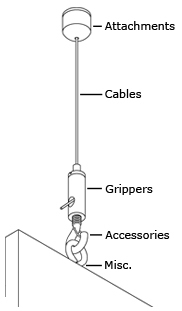 Length is measured from suspension point (“Ending 1″ shown below) to the end of cable (“Ending 2″).